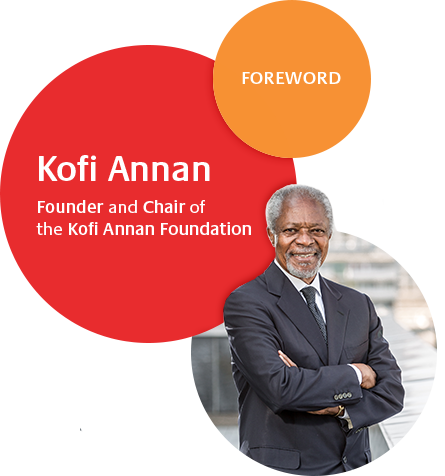 This year we mark the tenth anniversary of the Kofi Annan Foundation, which I founded after I stepped down as Secretary General of the United Nations. Through the Foundation I have continued to work for peace, development and human rights, the principles and causes that I championed during my tenure as Secretary General. From my mediation work in Kenya after the violent elections in late 2007, to my engagement in Syria, to the formation of the Global Commission on Elections and Democracy, and the West African Commission on Drugs, and most recently our work on elections in Mexico and Malaysia as well as in Myanmar’s violence-stricken Rakhine State, I have found that the road to peace is long and often uncertain. The good news is that most of the global crises that we face today can be resolved. We possess all the information and expertise to overcome them. Unfortunately, we often lack the leadership and political will to implement what experience and research have taught us. Short-termism – dictated by the next election cycle, the current business quarter or mere convenience – gets in the way. This anniversary report shares with you our efforts over the last year to galvanise action for peace and outlines the road ahead. There is much to do and, in the words of the poet Robert Frost, “miles to go before I sleep”.